Ethernet-based fieldbus standards have changed the game for machine builders. But with so many protocols competing to be most valuable and viable, how should you decide which to use? 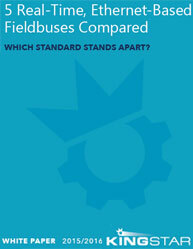 In this white paper, “5 Real-Time, Ethernet-Based Fieldbuses Compared,” we examine five different protocols that claim to offer the best price/performance open standard for real-time Ethernet fieldbuses. Topics covered include: Criteria for evaluating Ethernet real-time protocols 5 standards compared: Ethernet/IP, Ethernet Powerlink, EtherCAT, PROFINET IRT, & SERCOS III Evaluation of standards bodies, philosophies, and architectural underpinnings, response time, jitter, data rate, and more Fieldbus scorecard: which standard wins in price/performance and market acceptance? Understand your options when it comes to real-time, Ethernet-based fieldbuses. Read the white paper to see how the top five standards stack up.